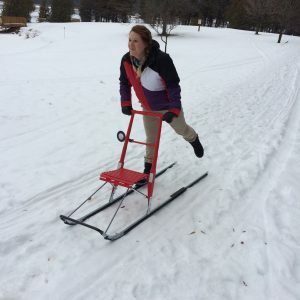 Kicksledding is an alternative to cross-country skiing for those who like a little more stability. It’s also the perfect family sport. The sled is easily assembled and folds flat for storage and travel. Kicksledding is perfect for the Canadian outdoors. It’s well suited for fitness training or just getting around outside in winter. This activity works the muscles in the lower back and in the back of the thighs. You can use it on compacted snow or ice. On bare ice or icy cross-country skiing paths you can travel at astonishing speeds with a kicksled. It’s is also great for the environment since it doesn’t create pollution or noise. Kicksledding is fun for everyone since it’s so easy to learn. Caution: Don’t use the kicksled on steep slopes as the sled can quickly reach a surprisingly high speed. Do not let children use the sled without the control of an adult.